Getting there: From MoPac in Austin, head west on FM 2244. Continue west on FM 2244 through the intersection with Capital of Texas Highway. Aproximately 3.5 miles after that intersection turn right on Cuernavaca Drive and then turn left on Commons Ford Road. Continue down this road for and look for the entrace to the park on the left. Parking is along the shoulder of the road. Look for a brown wind gauge and antenna on the left for an indication of where to park. 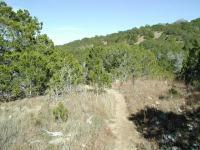 Much of the trail is heavily wooded with Junipers, Oaks and other trees. The Hike: Commons Ford Park was something of a mystery when we first found out about it. We had hopes of miles of trails and few people to disturb a peaceful hike. In some ways the park and the Waterfall Trail did not live up to those expectations. However, we found that we enjoyed the trail immensely. This small creek is carving the Commons Ford valley and providing some pleasant waterfalls. We're happy to report that the water appeared to be very clear. 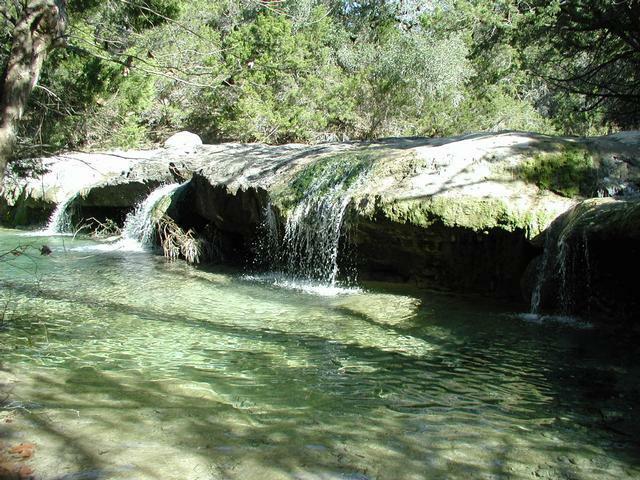 This hike follows a creek up stream where it emerges from the hills and empties into Lake Austin. At only a mile round trip it packs a lot of sights and sounds in a short trip. The trail begins at the waypoint "Trailhead". Like other Commons Ford trails parking here is anywhere along the shoulder of the road. Follow the well worn dirt path south for a short distance and it will suddenly become rocky and covered with trees and plants. 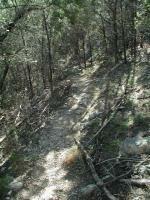 The trail for much of its length is rocky though for the most part not terribly rough. There are a couple of stream crossings, none of which posed a problem as the stepping stones put in place by others were more than adequite to get across the trickling waters. Did we mention that the trail is heavily wooded? Note that there were a lot of broken branches along the trail. A more significant flow of water became evident near the waypoint "Waterfall 1". The sound of flowing water can be heard well before it is seen. The waterfall here is not very large but it does produce a nice soothing sound. 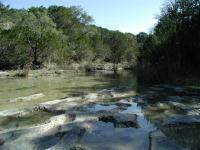 The creek runs into a slab of igneous rock here which it flows over. The rock surface has been carved by the water to resemble the curves and pitholes reminiscent of Sculpture Falls along Barton Creek. The remnants of a fence line can be seen here as it crosses the creek and continues up the slope on the opposite bank. This line does not mark the park boundary and so must be a relict of the property's ranching past. The trails pulls away from the creek slightly as it continues south. As it does so it also gains altitude. There is little strenuous vertical gain. The change is altitude is mostly felt by the views of the steeper slope beneath the trail. Although some spots along the trail are a little narrow, the danger of falling down the hillside is remote. The trail is well positioned along the slope of the hill overall. Occassionally the trail breaks into an opening, providing for some views of the hills. The waypoint "EF" marks the location of the Enchanted Forest geocache. There was not enough room on the map for the full name to be printed. This tough one is located on a ridge looming over the Waterfall Trail. We won't give away too much but plan your route up to the cache location carefully as the choice you make can determine how tough the ascent to the cache is. By the time you near the area of the Enchanted Forest cache you'll have heard the call of the trail's biggest draw - it's main waterfall. Of course if you hike during a particularly dry spell this may not be the case. During our December trip the falls did not disappoint. This pleasant multi-waterfall appears to be the end of the trail, but not entirely. The falls at the "Waterfall 2" waypoint are taller than it's downstream companion so it produces a richer sound. Like the waterfall encountered earlier the water runs into a large slab of rock that withstands weathering better than the looser rock around it. At this point it looked like the end of the trail and really it was, though we found a way to extend the trip and find some great valley views. Turn around here for a shorter hike. If you'd like to see more of the park look to the right of waterfalls rock slab. There is a way to climb up on top of the falls. From here a short path leads to water before it falls over the rock ledge. 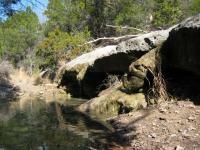 Here one can observe more rock patterns carved by the relentless flow of water. By hiking along the clearings on the opposite bank one can catch glimpses down the creek valley and cliffs on the far lake shore. On top of the ledge there appears to be a continuation of the trail on the opposite bank. By using the highpoints of the rocks carved surface it's possible to get across the stream without getting your feet wet. The trail continuation scrambles up a short but steep slope and then quickly disappears. However, the foliage here turns slightly less dense. The juniper is more spaced out with grasses in between. This provides plenty of room to continue straight up the slope of the hill. In some places there appears to be evidence of a fire having raged through this section of the hill some time in the past, which would explain the sparse sprinkling of the highly flammable junipers. 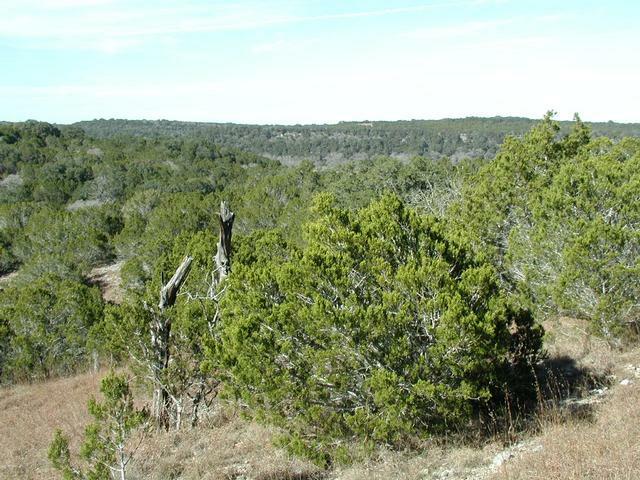 As we hiked up the hill the sparse tree coverage provided great views down the creek valley back towards Lake Austin. In some cases we could see the cliffs on the opposite shore of the lake. These great views made the extra effort to get to this point worthwhile. As you continue up the hill the tree coverage grows more dense and eventually the prospect of squeezing between junipers branches outweighs the curiosity of what's further up hill. As it turns out that's just as well since the trail was nearing, but not yet leaving the boundary of the park at the waypoint "Turnaround". At this point we headed back down the hill and back to the trailhead. The geocache that was placed in this park provides a way of describing the environment. In many ways it does appear to be an Enchanted Forest. The hour and a half that we spent hiking the trail was enchanting indeed. Got a bit lost but I had a lot of fun! Note that the 5.35 miles I hiked includes other trails at Commons Fords Park, not just the Waterfall Trail. I had never heard of this park but saw it featured on this site so I decided to check it out for a Sunday hike. I began on the other side of the road from the Waterfall Trail and walked down the very easy trail to the park area by the water, looped around, and then went off to find the waterfalls. I found the first, smaller waterfall(s) easily and crossed the creek. This is where I think I took a wrong turn and got on another trail. I found a washed-out bridge/road segment, which was pretty interesting to observe. 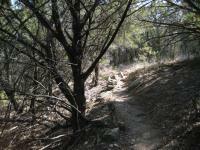 I then continued on to another trail which began a steep climb. When I reached the top I found myself at the boundary of the park. I followed the trail along the boundary where it made a very steep (and kind of scary) descent before turning away from the boundary. Not too long after this I arrived the the second, larger fall. This is a nice peaceful area and I rested here before continuing back on the trail and once again getting lost and finding myself back on the trail that follows along the park border. I saw plenty of people on the side of the park by the Colorado River but I only saw a family of three while on the Waterfall Trail. 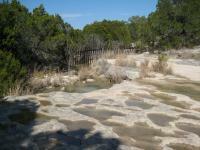 There is plenty to see at this park and lots of different terrain. I know I didn't cover all of the trails so I'd like to come back and explore some more. My sister also wants to get into hiking so I'll bring her here because the trails on the Colorado River side of the park are all nice and easy. Started out on what I later found out was the waterfall trail, at the west most ; there was some water at the first waterfall (enough for the dog to play), the second one was completely dried out. 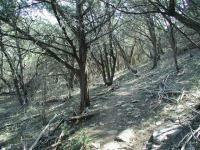 My companions and I continued past the second waterfall, uphill, to a rocky trail which led us to the park boundary. We found what resembled a trail that continued along the boundary fence, traversing along it, downhill then back uphill. We eventually made our way back downhill and connected with the trail that headed south connecting to the first waterfall area. Overall the hike was great, we passed one group within our two hours there. The waterfalls weren't much, but the water levels on many trails I've hiked lately have been low. Up, down, up, down made it a bit challenging but worth the hike back. Reminder: it is closed on Mondays and closed after 6 (the gate actually closes) so dont try this one after work. Not much of a hike here unless you park at the gate and walk down the steep grade...The real trail is at the bottom and it isnt long at all; but it ends at Lake Austin with a nice soccer field and a volleyball net right on the lake! Worth it for sure! Hiked this on a humid Sunday. There are 3 geocaches near the trail, we visited two of them. Good easy hike with 6 and 4 yr old. Lots of adventure and not too too difficult for the little ones. Water falls were really flowing with the recent rains. Great park! If you head north from the parking area, you'll end up at the manicured recreation area with a volleyball net and boating dock. This would be great for a family reunion or picnic, but it's a separate destination from the waterfall trail. The "waterfall" trail, which is south of the parking area, is very short and easy. You have to head down the road in a generally west direction to find the trailhead. We had the whole trail to ourselves on the way in, but crossed paths with about 20 young Cub Scouts and their parents on the way out (happily). I joked to one of the parents that it was "perfect timing." The water was very low, making the waterfall more of a water trickle. It was still fun to look around and hang out, but there is pretty much only one opening at the end of the trail, so had we be just an hour later, it would have been one big happy family with the Cub Scouts and us. That is to say, this is not like Sculpture Falls, where there are numerous nooks and crannies to sequester yourself away. Still, very much worth it for a quick "do." I've lived in Austin for 16 years and I've never heard of this place. It was terrific. There was no one there. We saw a few people on the river, but no one in the park. It could have been because we got there at 9:00 on a Sunday and the park does not open until noon for cars. We just opened the gate and walked in. The falls was not a falls because there was no water but the hike was terrific. There is also a great area for picnics. This is a spectacular park in the middle of town. I highly recommend it and I will be back. 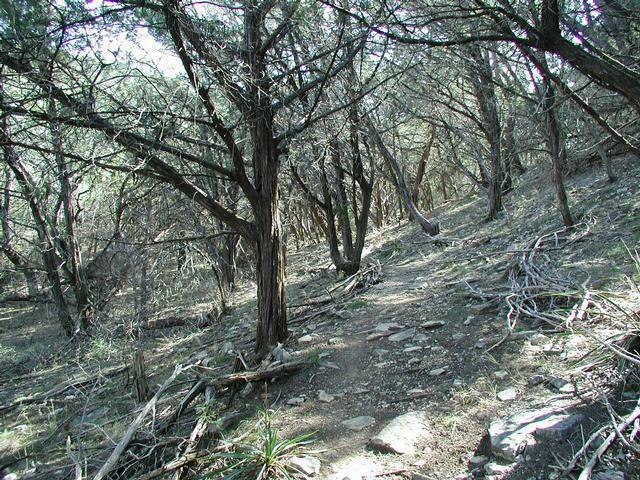 Little Watterdrop and I took this path after exploring the easier Pecan Grove trail. We made it to the first set of falls before we realized that 1. the creek bed was all dried up (makes the waterfall significantly less interesting) and 2. it was getting late and I didn't want to get caught by the 6pm gate, or stuck in traffic on my way back home. What we saw was very interesting, extreamly secluded, with lots of interesting flora and fauna. We found a small patch of water isolated in the creekbed with about 100 tadpoles of various species. The sound made by the Cypurs (?) branches in the wind was chilling, like something out of a horror movie. We will try this again when we have had some rain in the area.